Comparative Size of Lakes and Islands. 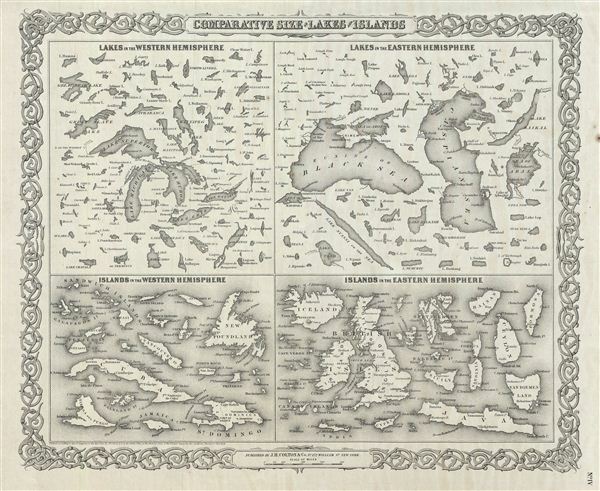 A beautiful 1855 first edition example of Colton's curious topical chart of the world's great islands and lakes. The chart is divided into lakes and islands of the eastern and Western Hemispheres. Curiously does not include Greenland - whose northern limits had not been explored when this map was printed. Colton does however include 'Laky Nyassi on the Sea' - a large lake in Africa that was, at the time, still largely speculative with regard to its size and orientation. Most people today associate Colton's Lake Nyassi with Lake Malawi. Surrounded by Colton's typical spiral motif border. Dated and copyrighted to J. H. Colton, 1855. Published from Colton's 172 William Street Office in New York City. Issued as page no. IV in volume 2 of Colton's 1856 Atlas of the World. Colton, G. W., Colton's Atlas of the World, illustrating Physical and Political Geography, (J. H. Colton and Company: New York) Vol 2, 1856. Rumsey 0149.002 (1856 edition). Phillips (Atlases) 816.